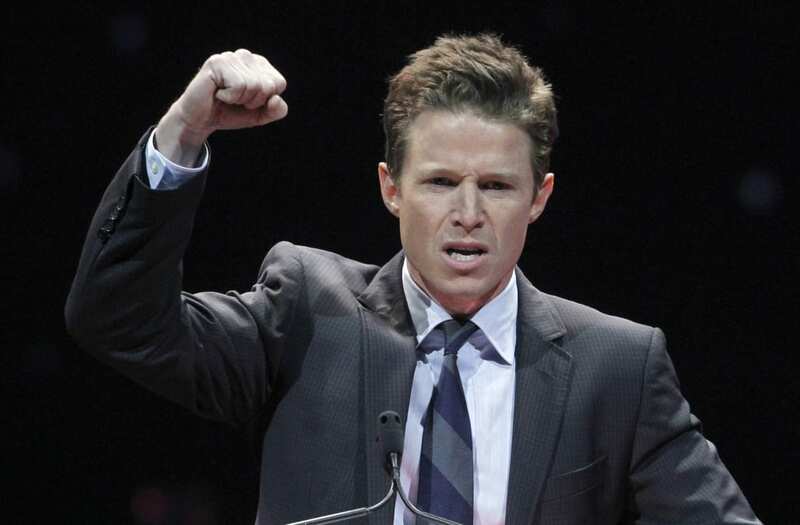 Billy Bush is finally opening up about the infamous "hot mic" recording of his 2005 conversation with Donald Trump that cost him his job at the Today Show. The former TV host sat down with The Hollywood Reporter and reflected on the tape's impact on his life. According to Bush, "plenty of people" at NBC knew about the tape's existence before it was leaked to The Washington Post in October 2016. He also reveals he's only been able to watch the tape three times, and hearing his comments always left him feeling "totally and completely gutted." In the infamous recording -- which was tapped while Trump was speaking with Bush on an Access Hollywood tour bus -- the president made sexually disparaging comments about women and getting away with lewd behavior while Bush laughed instead of saying something. "Looking back upon what was said on that bus, I wish I had changed the topic," Bush admitted. "[Trump] liked TV and competition. I could've said, 'Can you believe the ratings on whatever?' But I didn't have the strength of character to do it." As for the fallout, Bush opened up about how he explained his behavior to his daughters, Lillie, Josie and Mary. "My then-15-year-old, Mary, called me from boarding school, and she was in tears: 'Dad, Dad, Dad,' and I said, 'Everything is going to be fine, Mary. Everything's going to be OK.' It's just instinctively what you say to your daughter," Bush recounted. "And she said, 'No, why were you laughing at the things that he was saying on that bus, Dad? They weren't funny.'" "It hit really hard, and I stopped for a second, and I said, 'I have no answer for that that's any good. I am really sorry. That was Dad in a bad moment a long time ago. You know me. I am really sorry that you had to hear and see that. I love you,'" he continued. Bush said that one of the things that has hit him the hardest has been the idea that he's contributed to a culture of sexism and sexual objectification in America. "When a woman watches that tape — and this is what really hit me — they may be asking themselves, 'Is that what happens when I walk out of a room? When I walk out of a meeting, is that what they're saying about me? Are they sizing me up?'" Bush reflected. "I can't live with that. If a moment like that arose again, I would shut it down quickly." According to Bush, he didn't shut it down when Trump began making the remarks because he was trying to stay on the Celebrity Apprentice host's good side. "I always had a nervous energy through these situations because he also decided a lot of times from day to day, moment to moment, who he liked, who was in and who was out, and my job was to remain in," he shared. "I needed to be in, or maybe I'd be out. So that was the Trump environment." As for Trump calling his sexist comments "locker room talk," Bush says that characterization is totally false. "I'm in a lot of locker rooms, I am an athlete, and no, that is not the type of conversation that goes on or that I've participated in," he stated. Since the release of the tapes -- and Bush's subsequent termination from the Today Show after just three months -- the host said, "I found myself in a place of soul-searching. And I developed a commitment to become a better, fuller man." In his journey of self-improvement, Bush said sought out a number of different experiences that would help him look inside his soul, including The Hoffman Process -- a weeklong retreat aimed at self-discovery -- and he spent time with motivational guru Tony Robbins. "I attended his seminar. There was a powerful moment with Tony in front of 9,000 people at the Galen Center [in L.A.]. He walked to the end of the stage, and he pointed at me in the middle of his thing, and he said, 'One moment in your life does not define who you are,'" Bush recalled. "And the camera hit me, and these people started applauding -- it was a little overwhelming but really empowering." After being sidelined for over seven months, Bush said he's not going to retire from show business indefinitely, and has a plan for coming back into the mainstream fold. "But I plan to return to the job that I love, which is television, communicating, interviewing people," he explained. "I have changed in a way that I think will make me better at my job." WATCH: What's Next for Billy Bush?